The students spent the day in school with their partners today, attending lessons and experiencing first hand a very different education system. 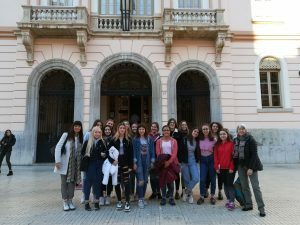 Many were asked to speak to English or other classes, both in English and Spanish and they all coped wonderfully, with lots of positive comments from the Spanish staff. Here are some pictures of them at school. I’m sorry we haven’t managed to get everyone – some are very resistant to having their photos taken, but they were all there! 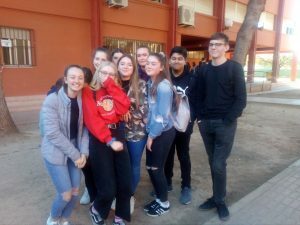 Some of the Year 10s on the school playground. Iona, Tia, Grace and Caitlin had not arrived yet, but who is hiding?? Still gorgeous sunny weather here – we will have a shock when we get back to England!